Many of our clients are looking for things to make their life easier, better, and more comfortable. Lotachi of Ubuntu Massage ticks all those boxes. She specializes in pain relief and pregnancy; has an office in Central Square or will come to you in your home. Scroll to see her beautiful office space! Please read on to learn more about Lotachi and her incredible business. Lotachi Izuchi-Johnson has been a Massage therapist since 2013. She holds numerous certifications, including Medical Massage, Pre- & Perinatal Massage, and Oncology Massage. She is currently training as a Human Movement Specialist with the Brookbush Institute of Human Movement Science, and as a Childbirth Education with Childbirth International. Lotachi offers an Integrative style of massage therapy and specializes in pain relief and pregnancy. Her focus is centered on working with people who have chronic pain and those with high risk pregnancies. Lotachi has been involved in birth work since 2012, and currently is providing pre- and perinatal massage, lactation counseling, and soon will be providing childbirth education. My name is… Lotachi Izuchi Johnson. My business is… Ubuntu Maasage. I’m a Medical Massage Therapist specializing in pain relief and pregnancy. My office is in Central Square in Cambridge. I also do home visits. My clients hire me because… they are looking for pain relief. 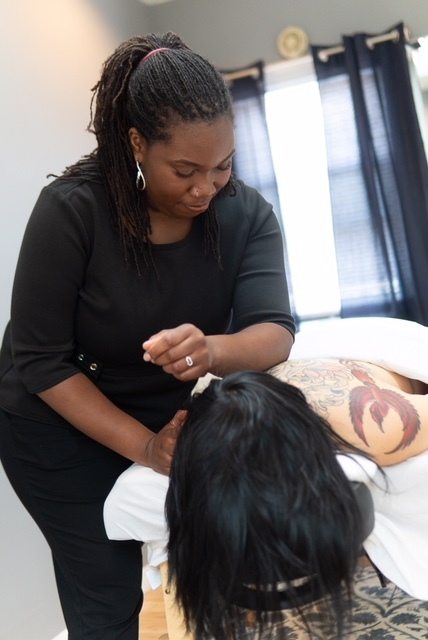 They keep coming to me because they find it, and love having regularly scheduled “me time.” My clients love that I use advanced deep tissue techniques and that every session is customized for their goals. Often they tell me it’s like no other massage they’ve had before, and they’re grateful for it! I do my very best to make sure every client is treated like a VIP, and I’m always looking for ways to improve the experience. In my free time, I love to… read and dance. One fun fact about me is… I used to go to 4 dance classes/week and be in a West African dance troupe. You can find me at UbuntuMassage.com, Facebook.com/UbuntuMassageTherapy, and Instagram.com/UbuntuMassage. Ubuntu Massage in Central Square, Cambridge.